Around ten years ago my father bought a used FTA satellite receiver and a small 65cm aluminum satellite dish targeting Hotbird 13* East. At that period, we couldn't receive the super beams from Hotbird and Astra 19.2* East was also out of reach. Moreover, the TPS system was broken, and most of the receivers were able to open the subscription channels even the pay per view (PPV). 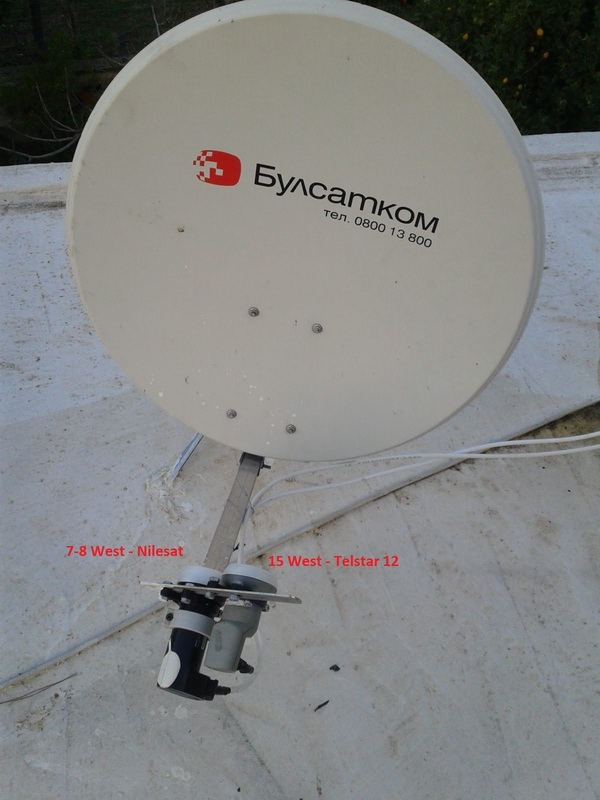 80cm old Bulgarian dish targeting Nilesat on 7-8* West. The second lnb targets 15 West. The second lnb on the right aims to 15*W Telstar 12. I 'm receiving 9 FTA channels. Depending of the time of day of scan you maybe receive more channels. Unfortunately i can't receive 12509 H where the MSNBC transmits. 12608 H is received with around 56% - 60% signal quality. It seems that Telstar 12 is on the limit for this dish size. 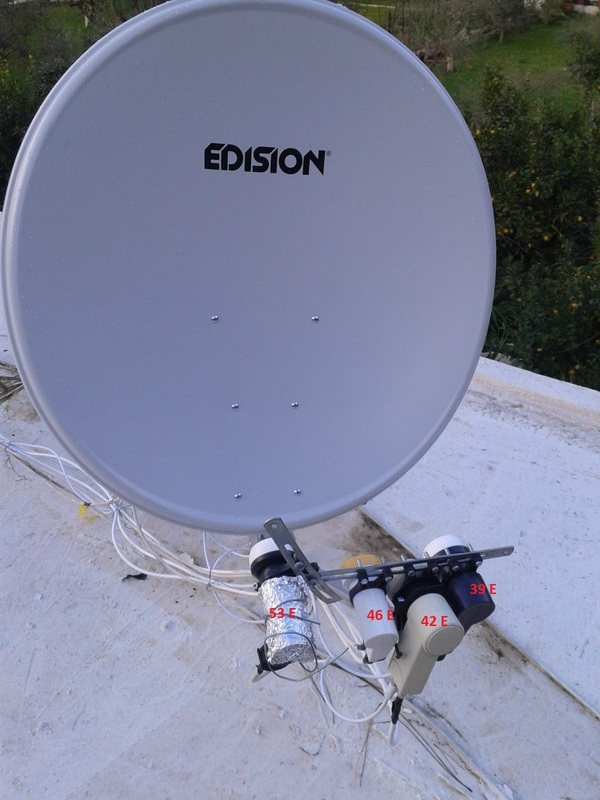 If you use 90cm separate or 1m dish you will probably have more luck. 19.2 East is easy to receive too. Next was the 9 East Eurobird that is quite an interesting satellite. Finally, also targeted 5 East for the Ukranian channels. The 90cm diameter aluminum is where everything started. It was the first upgrade from my first system around ten years ago. The setup is quite easy: 19.2 East Astra and 13 East Hotbird without any issue. I' m surprised with the power of some transponders on Astra. The other two satellite positions are more interesting. My first target was the 9 *E. There are a number of channels that really worth receiving them. M1/M2/Duna/TF1/M6 all in HD. There is also a KA transponder, but it targets Ireland. Here comes the surprise: I 'm able to receive three Greek channels. Next, I targeted 5*East. Initially I wanted to target 3*East, but it was really hard. So, I decided to target SES 5*East. Europe BSS is easy to receive so you can give a try. The beams I can receive contain mostly Ukrainian channels. No signal from Nordic and Sub-Saharan beams as expected. with 39 East of Hellasat. Also targeted 53 East for some Russian channels, but the reception was limited. Finally, I installed a 1-meter diameter aluminum dish look to the east. The dish targets 42*East Turksat. 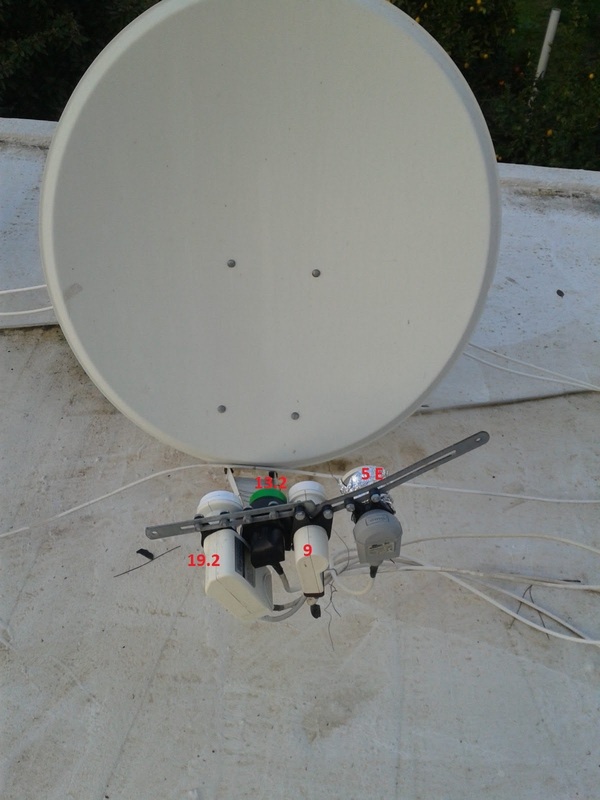 39*E doesn't have a lot of FTA channel, however, my father has a subscription on the Bulgarian provider Bulsatcom. Azerspace (46*E) contains channels from Russia, Azerbaijan, and Georgia with beams covering all the Europe. If you want to receive these channels in Ku Band, this is the only position. Moreover, I had a spare lnb, so I decided to target 53 *E. The lnb at 53 East receives ~23 channels, but nothing really interesting. Ideally i would like to target 55 *East, but it is really hard especially when using paracenter setup. Whats next? Hard to say, I 'm thinking replacing some of of the LNB with slim versions to also receive 16 East and remove 53*East. Other targets include 26 East or 4 West. The Diseq is only 10-1, so I'm also thinking to upgrade it to 16-1.